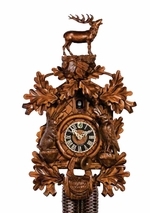 The main difference between the different types of cuckoo clocks is the mechanism that keeps it ticking. Most traditional cuckoo clocks are pendulum clocks that use weights to keep the clock going. Remember, these clocks were developed before batteries and electricity. The mechanism is genius. A small weight is attached to a cord or chain that is connected to a series of gears that prevent the weight from falling too quickly. The weight provides potential energy that is transferred to the pendulum and keeps it ticking. 1-day cuckoo clocks are so named because they need to be wound each day. You wind the clock by pulling up the weights. The cuckoo bird appears out of a trap door and calls once on the half hour and the number of hours on the hour. 1-Day Musical Cuckoo Clocks The 1-day musical cuckoo clock has the same mechanism. The main difference is that they play short tunes after the cuckoo calls each half hour and hour.